My friend Ana recently bought a new house. 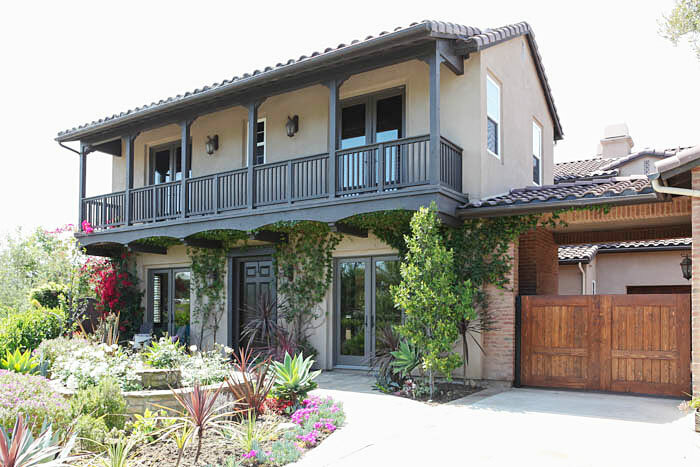 She and her family have been looking for a while and then finally they found this gorgeous house in San Juan Capistrano, about half an hour from where I live. Here is Ana and her kids and say hi to the newest member of their family: Skipper Darlington. Gotta love that name. 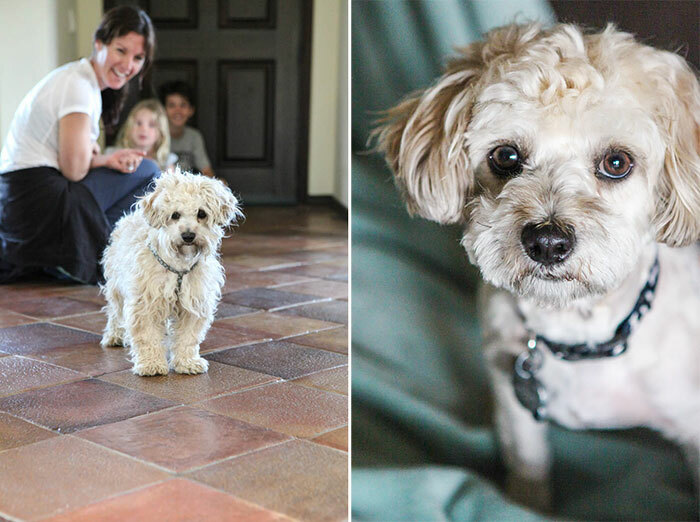 I happened to be there, the first time they brought home Skipper from the shelter - on the left. And then I took the photo on the right the next time I was there. By then he had been to the groomer. Such a handsome fellow. Ana asked me if we could make over her living room together and of course I jumped at the chance. Here you see what it looked like when she just moved in. This was about three months ago. They didn't like the dark paneled wall and fire place. She wanted the room to feel a little more light and fresh. She also wanted to get some new sofas and put up a gallery wall. In my next post, I will come back and show you some of all the details that went into the decision making process, but today, let's just jump to the after pictures. This is what her living room looks like now. So much brighter and much more welcoming, right? We had the entertainment center wall covered in tongue and grove and everything was painted white. The cabinets under the TV were re-built in a taller size and we got shaker style doors and new hardware. We added sconce outlets above the fire place. Then we put up a gallery wall over the new sofas. The inset wall behind the TV was pushed further out so the TV wasn't sitting in a deep hole and then we painted that wall a gold strie effect behind it. We created some interest over the fireplace with these scones and a big golden star-burst mirror with lots of detail. The gallery wall was created out of a mix of new things and art Ana already owned, such as the large map of Uruguay - Ana's home country and the pink whale in the top row which her daughter drew. As you know, I love to incorporate kid's artwork. Here is the mantel ready for its close-up. Chirp. Fact: putting a bird on it makes everything better. C-W are the initials of their last name. That scull just makes that gallery wall I think. 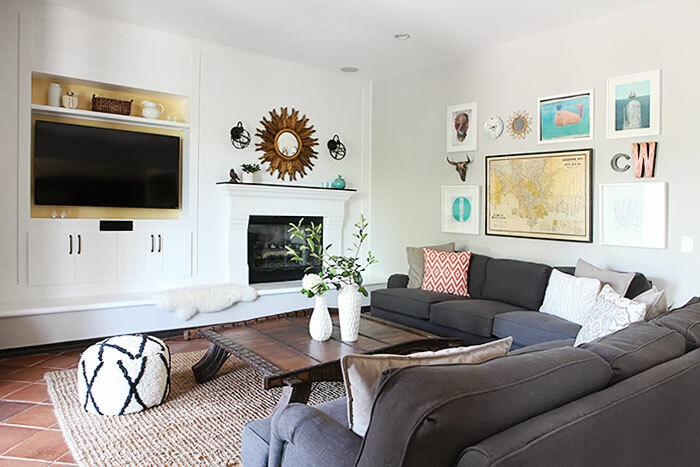 The gallery wall balances out the big entertainment center wall nicely. We added a white table in the corner between the sofas and Ana spray painted a thrift store lamp for this corner. A little greenery finishes out the coffee table which they already had. The yellow map is shouting a love song over to the insert behind the TV. They are getting along so fine. I will come back with paint colors, mock-ups, mood board and sources in my next post. Get the full list of sources and behind the design story here. 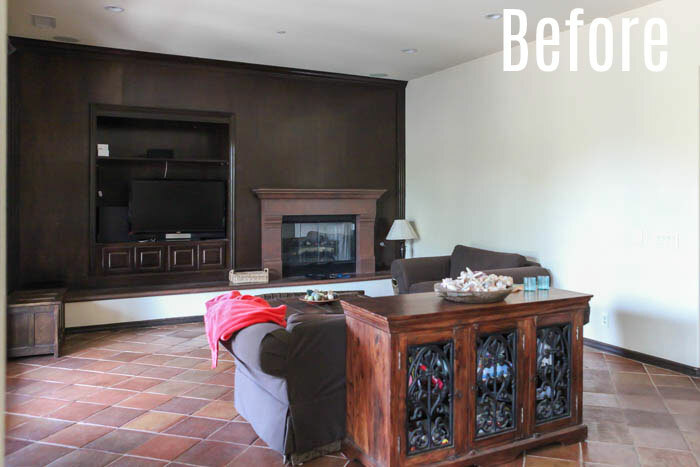 This article: Ana's Living room make-over - before and after first appeared on http://ahomefordesign.com.